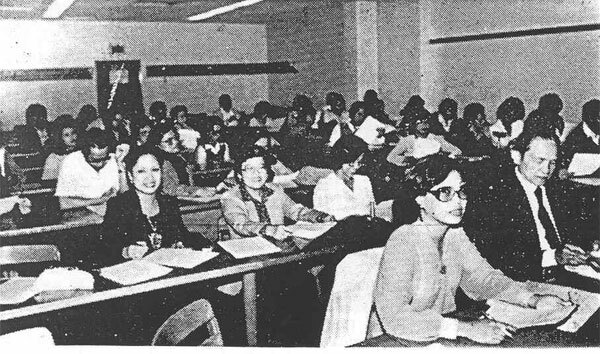 There had been previous proposals and attempts to organize a Filipino association of employees of the City of Los Angeles but it was not until March 1982, that the idea was realized. 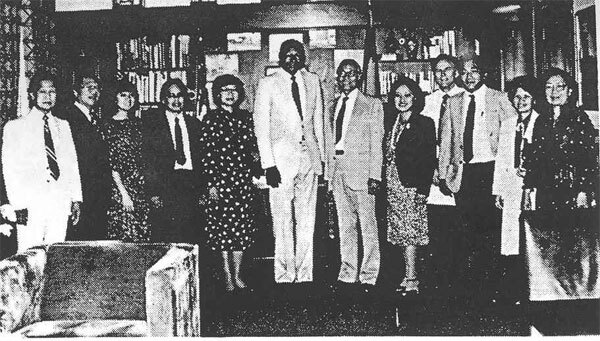 Larry Rivera, grants management specialist of the Community Development Department, was chided and persuaded by his office-mate, the late Dorothy Orozco Tyndall, then executive vice-president of the LACECA (Los Angeles City Employees Chicano Association), to organize the Filipino group. �What�s the matter with you Filipino?� she said. �You�re so many in the City and you don�t have your own association. Look at us Chicanos and what our association is doing for us.� She showed him LACECA�s newsletter, constitution and by-laws, programs and invitations of their annual banquets and other activities. Larry was then a member of the City Advisory Affirmative Action Committee, of which Cres Abad was chairperson. 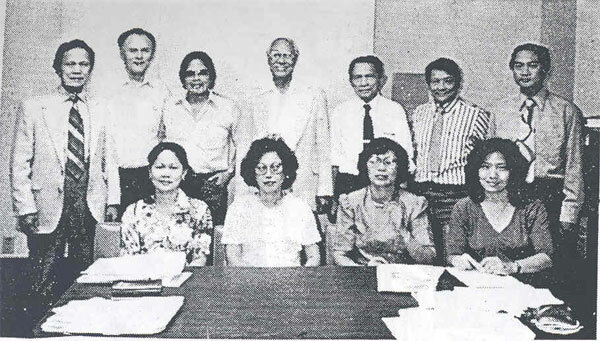 In one of the committee�s meetings, Larry broached to Cres the idea of organizing the Filipino Association. It turned out that Cres had been mulling over the same idea. So the two agreed to spearhead the organization of the Filipino association. The first organizational meeting was held at the Council Committee Chambers on Thursday, March 25, 1982. A total of 84 Filipino employees of the City attended, which was a rather impressive number for an initial organizational meeting. �This is the biggest turnout yet of the six ethnic and affirmative action organizational meetings I have ever attended,� said Sam Sperling, head of the Affirmative Action and Training Division, Bureau of Management/ Employee Services, Department of Public Works, who was a special guest. Larry called the meeting to order and moved to elect Cres Abad of the Personnel Department as the temporary president. Carol de Jesus of CDD was elected temporary secretary. Cres explained the need for and advantages of organizing an association of Filipino employees of the City of Los Angeles, Larry outlined the purposes and goals of the proposed organization. The assembly unanimously approved the proposal. Larry Rivera called the first LAFACE meeting to order and moved to elect Cres Abad as temporary president. Carol de Jesus of CDD served as temporary secretary. Anita Domingo, Meetings and Quorom. Larry consolidated and organized the suggested provisions submitted by the Committee members and prepared the first complete draft of the proposed Constitution and By-Laws of the association. JOINT SESSION � Members of the Constitution Ad Hoc Committee and the Election Committee at a joint session. Standing from left: Larry Rivera, Sam Sperling (guest), Rudi Bernabe, Cres Abad, Alfonso Alaan, Gregorio Soriano and Ruben de la Cruz. Seated: Rhodora Navarro, Anita Domingo, Evelyn Buranday and Carol de Jesus. At the general membership meeting held on May 11, 1981, at the Police Auditorium, the draft of the Constitution and By-Laws was presented to the body and it was approved with some corrections. At the same meeting, the name of the association was chosen, namely, �Los Angeles Filipino Association of City Employees� (LAFACE), which was proposed by Eve Buranday. LAFACE CONSTITUTION, NAME APPROVED � At a general meeting of members held on May 11, 1983, at the Parker Center the draft of the Constitution and By-Laws was approved and the LAFACE name was chosen. 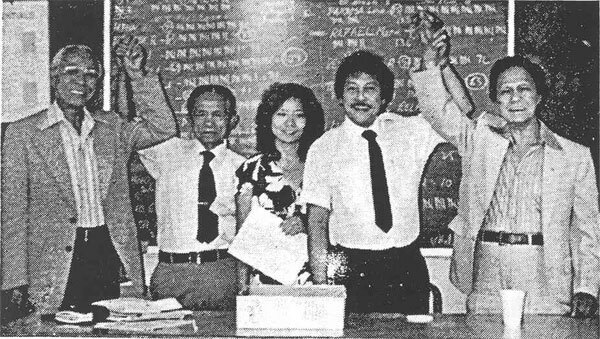 The first LAFACE election was held on July 21, 1982, under the direction of an Election Committee chaired by Alfonso R. Alaan with Ruben de la Cruz, Anita Domingo, Evelyn Buranday, Rhodora Navarro and Gregorio Soriano as members. Soon after their election, the newly elected LAFACE officers called on Mayor Tom Bradley and expressed to him the pledge of LAFACE to contribute to the advancement of service in the City government. Larry drafted the first designs of the LAFACE logo. The design approved by the Board was executed in the final form by Romeo Solidum, Filipino graphic artist of TV station KCOP. ELECTION COMMITTEE � The first Election Committee in session. From left: Evelyn Buranday, Gregorio Soriano, Anita Domingo, Rhodora Navarro, Ruben de la Cruz and Alfonso Alaan (Chairperson). 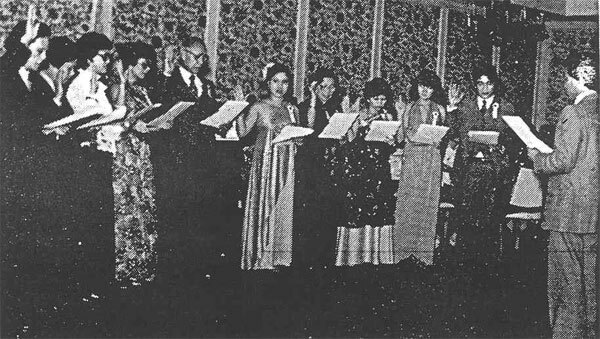 The first LAFACE Annual Dinner and Induction of Officers was held on October 23, 1982, at the Ambassador Hotel in Los Angeles with Ambassador Armando C. Fernandez, Consul General of the Philippines in Los Angeles, as guest speaker, and Judge Mel. Red Recana of the Los Angeles Municipal Court as inducting officer. The musical program featured Letty Libocon, celebrated Filipina lyric soprano, who sang nostalgic native kundiman and classical songs with Perri Bengson on the piano, and Ronnie and Cherri Solis, youthful and talented children of Carina Afable, popular Filipina singer and entertainer, with Norman Vito on the piano. The Silayan Dance Company, choreographed by Directress Sonia Capadocia, performed delightful native folk dances, culminating in the titillating tinikiling with audience participation in the end. The guests enjoyed dancing up to 1:00 A.M. with music furnished by Pan Gama�s Mobile Disco Music. Distribution of many free door prizes contributed to the fun of the select crowd. Commissioner Antonio P. Abagon of the City�s Human Relations Commission served as master of ceremonies. Several distinguished guests were in attendance, including Personnel Department General Manager John Driscoll and ACEBSA officers Jack Matthews, President; Michael Stewart, Second Vice-President; and Sidney Dallas, Treasurer. FIRST INDUCTION OF OFFICERS � The first group of LAFACE officers are shown being inducted into office by Judge Mel. Red Recana at the Ambassador Hotel on October 23, 1982. From left: Larry Rivera (PRO), Rudi Bernabe (Third Vice-President), Anita Domingo (Second Vice-President), Cres Abad, (President), Virginia Barrientos (Treasurer), Grace Aquino (Assistant Treasurer), Lina Partosa (Recording Secretary), Marie Rafael (Corresponding Secretary) and Ed Trillo (Auditor). LAFACE was registered with the City Clerk to invest the association with authority to represent its members in administrative cases and in the City Advisory Affirmative Action Committee. First Vice-President Evelyn Buranday and Second Vice-President Anita Domingo took charge of these workshops. Impressed by the success of the LAFACE Induction dinner event at the Ambassador Hotel, the FEU Tamaraw Club of Southern California and the Seventh Day Adventist Family Singers, led by songstress Letty Liboon, offered to the LAFACE Board of Directors the management of the first �Pasko sa Nayon� or country Christmas celebration of the Filipino community in Los Angeles on December 19, 1982. Believing in the worthiness of the project, the Board accepted the offer. The project also counted with the support of the Philippine Consulate General of Los Angeles and the CONPUSO (Confederation of Philippine-United States Organizations). Larry Rivera was appointed Chairperson of the Coordination Committee and Evelyn Buranday as Vice-Chairperson. The Pasko sa Nayon celebration consisted of songs and other musical numbers performed by the Seventh Day Adventist Family Singers, folk dances by the FEU Tamaraw League Dance Troupe, and Christmas and native songs with Letty Liboon as lead singer. It was held at the Hollywood Opera and Theatre on Hollywood Boulevard which was decorated with a typical Filipino barrio Christmas setting. A �parol� or lantern contest was held and a number of beautiful and colorful entries were presented. To complete the native atmosphere, a �pabitin� laden with Christmas goodies was hung and lowered to the delight of the younger members of the crowd. The celebration was a success and was televised on Station KNBC (Channel 4). 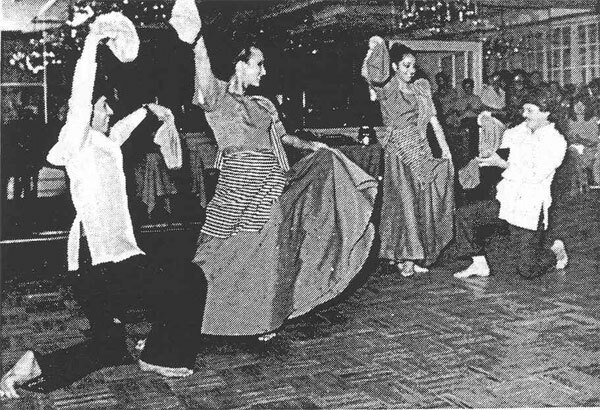 SILAYAN FOLK DANCERS � The Silayan Dance Company, choreographed by Sonia Capadocia, performed native folk dances during the first LAFACE induction dinner in 1982. They will stage the spectacular �Singkil� dance in tonight�s induction dinner. FIRST CALL ON MAYOR BRADLEY � Immediately after their election the new LAFACE officers of 1982-83 called Mayor Tom Bradley and pledged to him their support of the City administration. FIRST ELECTION � The first election of officers of LAFACE was held on July 21, 1982, at the Parker Center. Shown above are two of the victors with their hands being raised. From left: Cres Abad (President), Alfonso Alaan (Election Committee Chairperson), Carol de Jesus (Temporary Secretary), Commissioner Antonio P. Abagon (Chairperson, Constitution Ad Hoc Committee), and Larry Rivera (Public Relations Officer). The second LAFACE election was held in conjunction with a potluck picnic at Legg Lake on Sunday, May 22, 1983. LAFACE donated a lechon and drinks. Gerg Soriano was chairperson of the committee with the following members: Ning Belmonte, Efren Mamaril, Melba Cabangon, Rosauro Parocina and Romeo Giron. 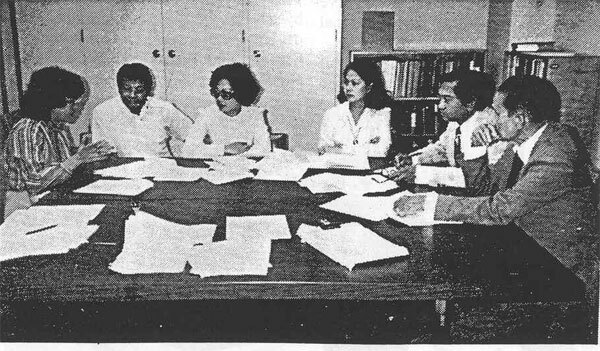 The Election Committee was originally composed of Anita Domingo as chairperson and Connie Domingo, Rolando Balanon, Fred Medina, Alfredo Bertulfo and Bruce Ortiz as members. The latter two members later resigned and ran for Vice-President. Elected were: Larry Rivera, President; Evelyn Buranday, Alfredo Bertulfo and Ludi-Cruz Herrera, Vice-Presidents; Virginia Barrientos, Treasurer; Visitacion Galang, Assistant Treasurer; Rhodora Navarro, Recording Secretary; Marie Rafael, Corresponding Secretary; Eliodora Tumbucon, Auditor; and Efren Mamaril, Public Relations Officer. Cres Abad is also a member of the Board of Directors as immediate part president. Rhodora Navarro later resigned and the Board appointed Emma Mojica (her contender in the election) to take her place as Recording Secretary. The election for the Presidency was declared a tie. However, Cres conceded in favor of Larry. On July 18, 1983 in order to foster the unity of members and the continued progress of LAFACE, Larry and Cres in signed letter jointly announced the results of the election as contained in the approved report of the Election Committee and appealed to the members to give their full support and cooperation to the present administration. 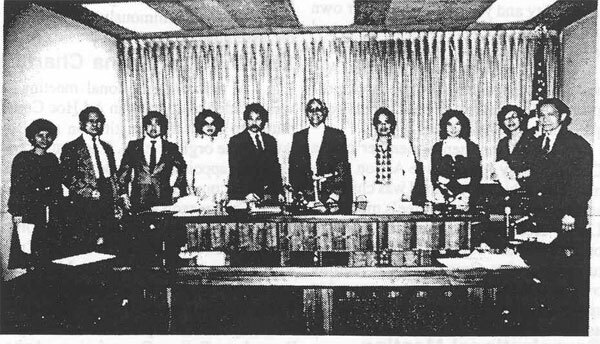 The new board officially assumed office on July 1, 1983. It has been meeting twice monthly recently in preparing and working for the upcoming Annual Dinner and Induction of Officers on October 22, 1983 at the Sheration Townhouse in Los Angeles. In order to raise the much needed funds for the association, the Board decided to hold a raffle in conjunction with the event. After the induction dinner, the Board will get down to work on a broad program of activities of LAFACE. LAFACE will continue its program of workshops and seminars on affirmative action, civil service examinations, employment and promotion opportunities for its members and other subjects. Social and fund raising activities are also on its planning board. The Board hopes that the �Tambuli� newsletter, the publication of which has been held due to shortage of funds, will be published soon after the induction dinner. The Board of Directors is appealing to all its members to pay their annual dues and extend their full support and cooperation to the officers so that LAFACE can undertake its projects and activities for the benefit and enjoyment of its members and for the greater progress of LAFACE.